Hummingbirds are the tiniest birds on the planet. The Bee Hummingbird of Cuba is 2.24 inches long or 5.7 cm, and nearly half of that length is in beak and tail! But not all hummers are tiny. The Giant Hummingbird, which lives in the Andes Mountains from Ecuador to Chile, is 8 inches long—as big as a starling! There are a LOT of different hummingbirds between these extremes. This huge family has about 320 species. The biggest variety is found in the equatorial belt, ten degrees wide, across South America. More than half the species are found there. Moving north, the number of species declines. Fifty-one species breed regularly in Mexico, thirteen in the United States, and four in Canada. Hummingbirds are famous for more than their beauty and tiny size. They're the only birds that can fly backward as well as forward. When hovering, hummers can beat their wings from 22 to 72 times per SECOND. How do people know that? Scientists used an instrument that flashes light at extremely short intervals, called a stroboscope, to measure it. Hummingbird hearts beat amazingly fast. A Blue-throated Hummingbird's heart races at 1260 beats per minute; this is a fairly large hummer, and ornithologists figure the much tinier Ruby-throat and Rufous Hummingbird's hearts must beat even faster! Hummers can fly steadily at about 29 mph unless wind helps. In courtship flights, they really zoom. One pair of South American Violet-bellied Hummingbirds was clocked at 49 mph. Their flight muscles take up about a quarter of their body weight. 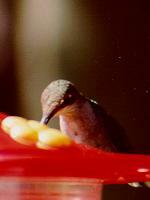 Hummingbirds are BIG eaters, normally consuming over twice their weight in nectar and insects every day! Most of the weight of their food is water, but if you measured just the protein and sugar of their food, it would still be about half their weight every day. That's the same as if a hundred pound seventh grader ate 200 cheeseburgers every day! 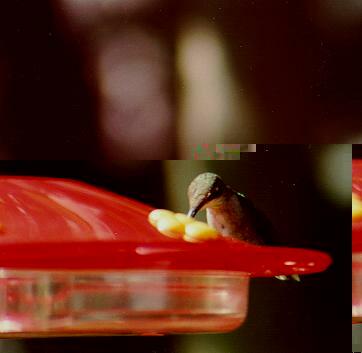 Hummingbirds digest their food very quickly. It takes about 10 minutes for a fruit fly to pass through a hummingbird from one end to the other. In captivity, hummers can live about as long as dogs, or about 9-14 years. And at least one banded wild hummingbird lived to be over 12. For more information about hummingbirds, read The Life of the Hummingbird, by Alexander Skutch (Crown Publishers, NY, 1973; ISBN 0-517-50572X), or check out Hummingbirds!